I’m usually being negative in these, so a change in pace is in order. I won’t even mention how bad a name megamorph is. I’m not saying anything about each of them individually, but the fact that there’s 25 dragons in the set is a win in itself. Also of note: None of them are common (unless I missed something, as this set isn’t yet in the Gatherer). 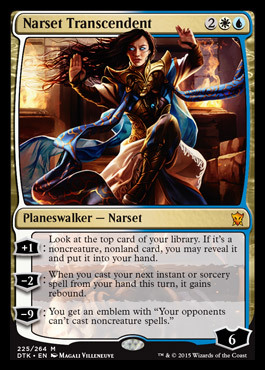 So, they are major theme and you’ll be seeing plenty of them, but they haven’t been pushed into common, even though MaRo often says that something isn’t really your theme, if it isn’t in common. Here the decision to avoid that was the right decision. Of course the Dragons are there in many other ways as well and are thematically present and in the art of many commons as well. Just a nice touch here… These five were the khans of the clans a couple of sets ago. Now, things have changed. 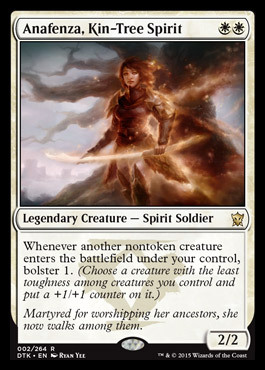 Instead, Anafenza died and is now a spirit protecting her brood, but pretty much an outsider, because she is still involved in the styles of magic the brood has forsaken, Narset’s spark was ignited, Sidisi’s talents are now used in an advisory position, Zurgo is a lowly servant of Kolaghan, and Surrak is still using his punching skills, but now to feed Atarka. For many of these it feels like a fitting epilogue, but Surrak sort of feels to me like this is a revision of his story, and we really should return to him at some point in the future. Perhaps as some sort of rebel leader against the dragons some time in the future (perhaps in the second set of the block as he would need some convincing). 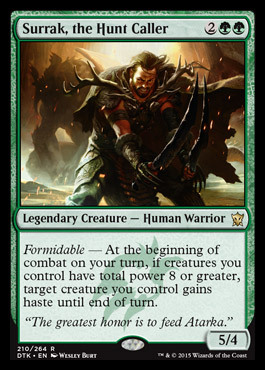 This has probably never happened before, but in the name of the draft format, I guess it was a good idea to reprint some limited staples from Khans. This actually has more of a black feel to it, but in a set centered on two-color pairings with one color being the dominant one, you have to stretch the color-pie somewhat. I think this one is reasonable in that regard… especially because the flavor is so good. So, this guy just kills the biggest thing he can find and does his best to make it as gruesome as possible. In fact, so gruesome, that often huge monsters, such as dragons, will be so afraid and disgusted that they’ll retreat. 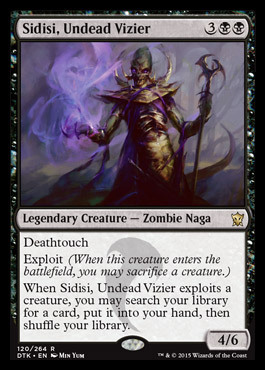 Of course, this comes at a price, but that’s the way of the Silumgar Brood. I have a very strong inclination to underscore this further by using profanities, but I try to avoid that in this blog, and thus I’ll save them for another situation, where I feel I need them more, but that’s just because I don’t think the awesomeness speaks for itself here. 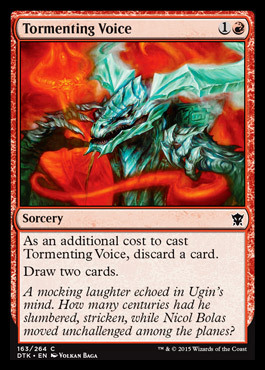 This entry was posted in Magic: The Gathering and tagged dragons of tarkir, flavor judge by Aki Vainio. Bookmark the permalink. 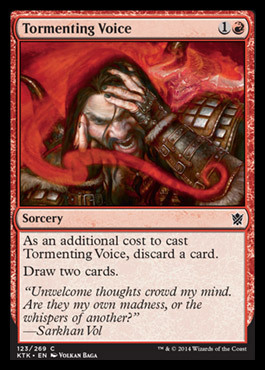 Yes, I remembered that card, but did not count it, because its from a different set.